I Love My Child But Sometimes I Can't Stand Him! You’d do anything for your child, but you feel guilty about admitting the truth, even to yourself. The truth is, sometimes you don’t like him very much. It’s a secret that many parents of acting-out kids share but rarely confess to anyone. James Lehman explains how dealing with a difficult child can take its toll on the parent-child relationship, and he gives you some practical advice on how to handle it. I think there are also periods of time when parents don’t like their child because of a certain stage their son or daughter might be going through—adolescence. As a father, I experienced this myself. When my son was eight or nine, he was a pretty good kid most of the time. I really liked being around him. And I couldn’t imagine him ever leaving home, with all the unpredictability and risks that were involved. But by the time he was in his mid-teens, I disliked his behavior so much that I was ready for him to go. A child’s adolescent development and identity formation almost always includes breaking away from their family. Sometimes that translates into obnoxious, annoying or self-involved behavior on the part of teenagers. And because the parent-child bond is so strong, that breaking-away process often becomes very strained and stressed for everyone as time goes on. For adolescents with unstable behavior, it can even become destructive or violent. An important part of this separation process is that the parent learns to let go. Ultimately, the parent wants and needs to push the child out into the world. They get tired of having this strong-willed, opinionated person in the house, making demands and arguing with them all the time. When their kids are in their late teens, many parents want them to go to college, find a job, move out, or rent an apartment with a friend. And I think that’s completely natural. It’s all part of your child growing up and starting a life of his own, even if it’s painful at times. 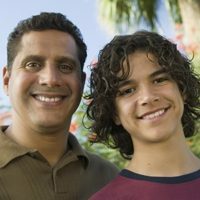 This is the time that parents complete the parent/child part of the relationship and begin the parent/adult-child relationship. This transition is rarely without friction. Here’s an important distinction I’d like to make again: not liking your child’s behavior is very different from not liking him as a person. That’s hard to define for a lot of parents because a child’s behavior becomes part of his personality in some ways. In fact, you often can’t see where he ends and the behavior begins. And it’s not only his behavior. He also might be using his personality to confront, attack, or demean you. Physically, you also associate him with his personality: the words are coming out of your child’s mouth, after all. You can see the nasty look on your daughter’s face. You can hear the rude tone in your son’s voice. It’s easy to get frustrated and annoyed with those behaviors, and it becomes easy not to like the child who’s performing them. A lot of my direction for parents is to not take this personally. Although this often feels like a personal attack upon you, it’s actually driven by other forces such as your child’s fears, frustrations, and the need to develop their own identity. Try not to fight it. No matter how hard it may be at times. Avoid screaming at your child and getting into conflicts and unnecessary power struggles. Parents often take that kind of behavior personally, but remember, there are irresistible developmental forces taking place here, for both the parent and the child. One of the things I try to teach parents is to talk more positively to themselves. This may sound simplistic but think of it this way. We all talk to ourselves all the time, because we think in words, and perhaps too much of the time, we think in negative words. Here’s the truth: if you’re talking to yourself negatively on the way home, you’re feeding into the problem. If you are expecting a fight when you come through the door, you will get one. Instead, I recommend that you say things to yourself like, “What can I do differently so we won’t get into an argument as soon as I walk in the door tonight?” In other words, think more about the solution, and less about the problem. Talk to yourself about the skills you can bring to the situation. One of the things I recommend to parents who work is to have the following rule with their kids. For the first ten minutes after you get home, your kids should leave you alone. That way, you have enough time to go up to your bedroom, change your clothes, and get your head ready for parenting your children at night. Transitions, and by that I mean going from work to home or school to home, are difficult for both adults and children. Try to organize your time so that you’re taking that into account. You may feel like people are looking at you and judging your parenting as inadequate when your child’s behavior is inappropriate. All of us hate being judged, all of us. And even if we deal with it effectively, that doesn’t mean it’s not a problem. It just means that we don’t take it personally anymore. If your child is acting out, you might have tried to tell your parents, other relatives, or friends about it in the beginning. But if this is a persistent problem, most people eventually get tired of hearing about it. Even family members and friends can be very judgmental and critical. And when they are, it’s easy to experience that judgment as shame and guilt. As a result, you may feel as if others don’t see you as a good parent. It also doesn’t help that you already have doubts about your parenting, because it doesn’t seem to be working. And then whenever your child behaves inappropriately in front of those people, you feel shame. Those are heavy, powerful feelings. And many parents blame and resent their kids for making them feel that way. It’s a vicious cycle. I advise parents: don’t blame your child for how others are making you feel. Just focus on your child’s behavior and not on how others are making you feel. If you can do this, you will feel better and you will be a more effective parent. What I always tell parents is, “Don’t compare your insides to other people’s outsides.” What does this mean, exactly? On the outside, most families look normal and stable. Indeed, we tend to avoid having screaming matches with our kids in public. But behind closed doors, it’s is often a different story. Even the most normal looking family has problems. And every parent has struggles with their kids—it’s part of raising kids. We ALL have problems. So, don’t compare how you feel about your family and all its shortcomings to how other families appear from the outside. It’s not a fair comparison. And it will always make you feel inadequate in comparison. Another way to think about it is that your family might actually appear fine to most outside observers. But this is just because you keep your problems mostly behind closed doors. You don’t have your fights in the open for the public to see. That’s why I tell parents not to compare your insides to other people’s outsides. Again, it’s not a fair comparison. By the way, this is also true on a personal level. Comparing your emotional insides to other people’s physical outsides will only give you a skewed impression of what’s happening. And usually only makes you feel worse about your own situation. Don’t do it. This is also one of the patterns that give adolescents so much trouble. They compare their insides to their classmates’ outsides. The other kids may look like they’re popular and as if they fit in. But those kids may be in just as much emotional turmoil. This can cause your child a lot of distress. Think of love as an action rather than a feeling. I’ve found that most parents do love their children, even if they don’t always like their behavior, and even if they don’t feel as if they like their child at that moment. Remember, unless your child has severe behavioral problems, being argumentative and annoying—especially during adolescence—is usually a developmental phase they’re going through. Don’t get me wrong, it’s often a long phase and a difficult one. Sometimes kids don’t gravitate back to their parents until they reach their mid-twenties, or even until they start to raise families of their own. But in my experience, most of the time parents and kids are eventually able to find a way to have a good relationship again—especially if the parent is willing to put in the time to help their child change their behavior now, when it counts. And for severely defiant kids, it’s especially difficult. 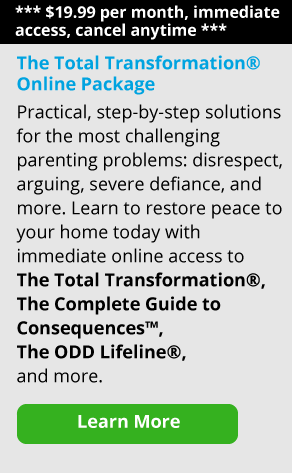 Most therapists will tell you that a child with oppositional defiant disorder (ODD) is one of the hardest kinds of kids to work with. First, they won’t talk to you, then they lie, then they’re abusive, then they’re negative, then they blame everybody else for their problems. These are tough kids, and they’re tough to like. Sometimes they’re tough to love, too. And that’s okay, we’re only human.